To record any financial transaction currency is needed. Each country has an individual currency. SAP standard system provides all the existing currencies as per ISO standard. SAP also provided flexibility to create new currency as per ISO standard. 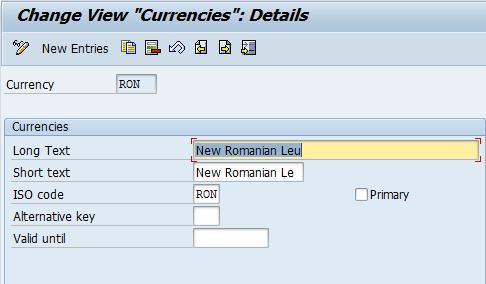 SAP issues a note to create new currency with respective configuration details. SAP released note 791997 with the setup of currency RON in SAP. This step is necessary to create a new currency in SAP with text, ISO code and all other details. This step is necessary to set decimal places for a currency. Decimal places configuration cannot be changed after transaction posted because it will lead to data inconsistency. In our example, for currency RON decimal places should not be maintained (according to the recommendations specified in the note 791997). This step is required to maintain currency conversion ratios to allow foreign currency transactions. A company code is in the currency INR whereas I have to book an invoice in USD. To allow this transaction first the currency translation ratios for INR/USD and USD/INR to be maintained. Next, the system will allow to maintain exchange rate and finally a user will be able to book the invoice in USD. In the above screenshot ExRt refers to an exchange rate type, exchange rates are maintained against an exchange rate type hence transaction ratios are to be maintained at an exchange rate type. The exchange rate type M means the standard translation at the average rate provided by SAP. By default, the SAP system considers exchange rate from the exchange rate type M (if other exchange rate types are not maintained). As per the client requirement it is also possible to create a new exchange rate type. Currency translation ratios are to be setup against the new exchange rate type for maintaining exchange rates. Alt. ERT refers to an alternative exchange rate type. Instead of fetching from the exchange rate type M, the SAP system can fetch from the alternative exchange rate type for certain time period or certain currency combinations. Exchange rate is also fetched from the alternative exchange rate type. This step is necessary to maintain exchange rates for currencies against an exchange rate type. This activity needs to be performed at the client level on a daily basis. In the above screenshot, the exchange rate is maintained between the currencies RON and BRL on a daily basis. 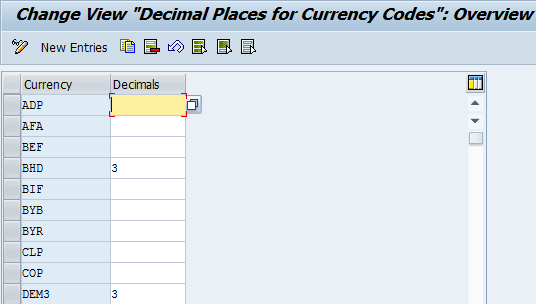 In the new G/L SAP accounting, a company code can have 3 currencies. The first one is the local currency (company code or functional currency). The second and the third currencies are maintained as per the reporting requirements. For example, a company code currency is INR, whereas the second currency is USD and the third currency is EUR, so if a document is posted in the local currency (INR), the system in background updates values in USD and EUR through the exchange rate maintained in this transaction. It is not mandatory to maintain the additional two local currencies in the new G/L. They can be maintained if there is a requirement. It is necessary to configure the same currencies in Asset accounting as well. In SAP, we have 5 different kinds of currencies as explained below. Company code currency: The currency in which a company code is configured. Group currency: The currency is assigned at the client level. Hard currency: The currency which is assigned at the country level. Index based currency: This currency is assigned to countries in case of high inflation in these countries. Global company currency: The currency is assigned to a company or an internal trading partner. The steps described above are the basic settings to define a new currency in SAP. In addition to the above, we also have other configuration settings available to define expiring currencies. For example, the currency ATS (Austrian Schilling) is expired due to the introduction of EUR currency.